Flemish painter. Although born in Antwerp, Jacob van Hulsdonck was raised in Middleburg, the southwestern Dutch town where Ambrosius Bosschaert the Elder and his circle worked. He first studied painting in Middelburg and for forty years in Antwerp Hulsdonck remained loyal to Bosschaert s subjects and meticulous style, though in this comparatively late composition Snyders s sense of rhythm and convincing sense of space appear to have influenced him. 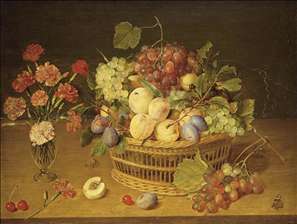 He returned to his birthplace at the age of twenty-seven and established his own studio that specialized in still-life paintings, normally fruit pieces composed of perfect, brightly coloured plums, grapes, and peaches on ordinary tabletops as their primary subject. He may have worked in Osias Beert s circle before becoming a Master in the Guild of St Luke in Antwerp in 1608. His paintings were admired for their beauty, delight in textures, and delicately drawn shapes.